It never occurred to me that the picture opened more often than any other on my blog would be green polka dot shoes. Just when you think your funky tastes are totally unique. . . I could have expected searches that relate to the person searching would be popular, such as: number one song the day your were born and what your drink says about you. But how do you account for a strong caterpillar and gold crested gecko following? Many are looking for Jesus here, little Jesus to be exact. None of the above searches scare me, but I hope the scores of guys in their mom’s basement looking for zombie lights stay right where they are. Oh, why the title above? I’m no fool, just a hit whore who knows how to play the game. Tis the season I don’t have time for 2,000 words, so their equivalent will help me touch base. This is what is going on in my wildlife garden right now. 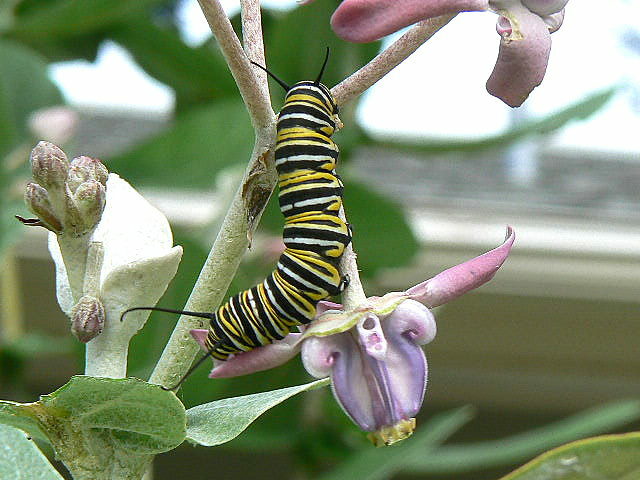 At least six Monarch caterpillars have hatched on the broad leaf Monarch plant that grows as high as the eves out front. It’s a caterpillar condo with the finest acomodations. 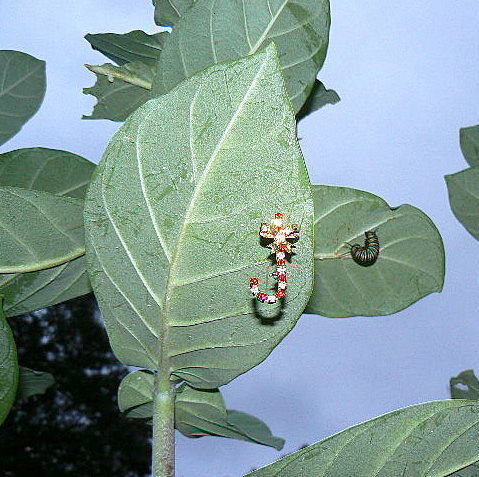 These guys hatch on the leaves, then start munching them for sustenance. The ones with finer tastes take a table by the beautiful blooms and have a regular luau. One has already begun his new cycle. He’s formed a “J” and will soon create a beautiful, gold crowned crysalis, after which he’ll emerge in a week or ten days as a Monarch butterfly to start the cycle over again. I could not resist taking the Jesus candy cane off my lapel to hang beside him. The similarity smacked me in the face. A glance up the well lit street and my house looks pretty bare of decorations, but then on closer look, nature has added trim no store could match. This is a preview of new beginnings in one of many wildlife gardens and yards. Stay tuned for coming out parties and first flights (hopefully). Note: Click pictures to enlarge. A short walk outside my front door caught these wonders. The Monarch caterpillars are larger than ever since we got a broad leaf milkweed. They obviously still love the old kind because they stripped it first, but seem to get fatter than usual before finally tucking their necks (do they have necks?) and forming a chubby “J” right beneath the leaf they have been eating on. Seems that was as far as they could waddle. The next morning we have a bright green crysalis, and in another day the gold crown and buttons at the bottom begin to shine in the sun. I’ll try to catch the coming out party in about seven to ten days. If Hurricane Hanna comes this way, we’ll snap that leaf off and bring it inside. We did that once before and woke to a butterfly in the office. The other shots are just flowers still decorating the yard and the surface of our glassy pond, teeming with life. Though it goes dry at times, rain brings fish and other aquatic life back into this area and restocks the pond for us over and over. Before our house was built, the neighborhood kids called the property Frog Bog. We’ve tried to keep it friendly to the frogs and any critters who like to take up residence. It’s easy to make your property welcoming for them. Check out my link to Backyard Wildlife Habitat and get started.